SALINE, Mich. – R&B Plastics Machinery LLC, a leading manufacturer of blow molding machinery, single-screw plastic extruders and extruder process screws, has announced the sale of a MAX multilayer single-screw extruder system to TG Fluid Systems USA Corp., Brighton, Mich., for the production of multilayer automotive fuel lines. The three-layer fuel line system from R&B features an advanced control system platform and new adjustable extruder assemblies which deliver improved productivity. The sale to TG Fluid Systems comes amidst strong growth in the automotive industry for fuel line systems, according to Dave Corson, Dir. of Sales and Marketing for R&B Plastics Machinery. "There's a surge of new orders as OEMs and Tier suppliers develop new applications, expand capacity, and bring on new multilayer fuel line systems," explained Corson. TG Fluid Systems, a division of Toyoda Gosei North America Corp., is a leading fuel systems supplier to major automakers including Toyota, Honda, and General Motors. The company will produce three-layer fuel lines made of nylon and fluoropolymer materials. The MAX extruder line offers an advanced control platform featuring Allen Bradley and Ifix systems which manage the entire line from one operator station. R&B also provides customization of all control platforms and aligns with the customer’s internal process and manufacturing level. New adjustable extruder assemblies feature linear bearings with a ratchet adjustment to eliminate the traditional pole assemblies and overhung weight issues. R&B Plastics Machinery sells extrusion systems, blow molding machines, and performs extensive rebuild/modernization of all competitive equipment. In addition to automotive, R&B's customers represent diverse end-use markets including food/beverage, personal care, medical, motor oil/lubricants, household cleaners, detergents, and lawn/agricultural chemicals. Modernization and upgrade services bring older machinery up-to-date, thus providing measurable productivity improvements, faster cycle time, energy savings, improved quality, and greater efficiency and consistency. Cost savings are measured in decreased labor, utility, and materials usage. 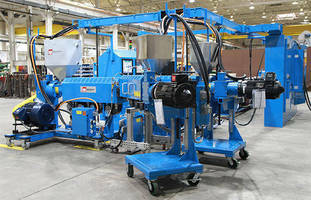 R&B Plastics Machinery LLC, based in Saline, Mich., is a manufacturer of blow molding machines, single-screw plastic extruders, extruder process screws, and trimming systems that can be custom configured to meet the most demanding process applications. An experienced technical staff engineers machinery to provide maximum output and superior performance. With one of the most comprehensive field-service/support groups in the industry, R&B Plastics Machinery ensures that machinery remains current. R&B Plastics' sister company, Monroe Mold, based in Monroe, Mich., makes cold-end tooling and molds for the blow molding market. The partnership between R&B Plastics Machinery and Monroe Mold provides customers with the most comprehensive turnkey solutions for blow molding machines, single-screw extruders, and trimming/deflasher systems. For more information, visit www.rbplasticsmachinery.com.